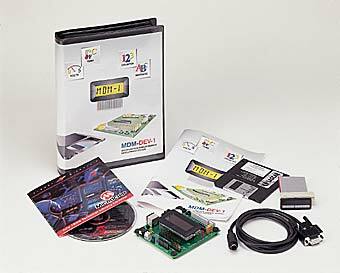 The MDM-1 is a well packaged display driven by a microcontroller. As such the choice of software is up to the developers own preference. Microchip provide a complete development environment including an assembler for free. JAL is a software language which resembles Pascal and is specifically designed for PIC's. A free compiler with a variety of libraries, development tools (Jalcc) and discussion list (JAL List) is available. Basic is available from a number of third parties and drivers have been added for the Proton from Crownhill and PICBasic from ME Labs. XCSB is also very powerful and feels more like C.
Other software is available i.e. Pascal. If you require someone to design software for the MDM-1 then a list of 3rd party developers is provided.